Ask anyone about the art of tidying, the odds are they will nearly all mention Marie Kondo and her book, The Life-Changing Magic of Tidying Up. After multiple rounds of decluttering exercise that do not seem to end, I decided to check out Marie Kondo’s book, her once-in-a-lifetime tidying marathon and every item that you possess should bring joy approach. 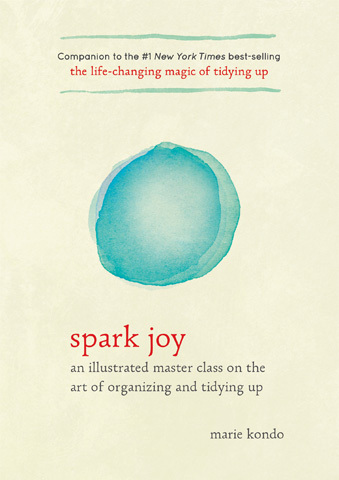 I was at Kinokuniya and picked up Marie Kondo’s latest book, Spark Joy, an illustrated guide on how to tidy, giving examples of potential pitfalls. Reading the first few pages of the book helped me recognised the mistakes I have made in the past and why I am decluttering all the time. I like her KonMari Method, very structured, leaving little room to stash away things that should be discarded. I have been decluttering regularly for my multiple home moving. The focus of my decluttering exercise then was finding space to store what I have and discarding what I have no space for. It did not help as I am pretty good at squirrel away things. Many a time I bought things that I already own. Following the KonMari Method, the first to tidy are my clothes and by category and not location. I took out all my clothes that I stored in my wardrobe, chest of drawers, including my autumn and winter wear that I store in the cabinet in the living area. I went through the pile of clothes sorted by casual wear, business wear, home wear, autumn/winter wear, sportswear, lingerie, belts, etc. Picking up a piece at a time and placing those I want in my wardrobe and chest of drawers, putting the rest in plastic bags to give away. To my surprise, I ended up with four bags of clothing and belts to give away. Now, my wardrobe has some breathing space, I can easily browse and choose what to wear. Yeah! Next in the list, my bags. I took out all my bags in my wardrobe, went through one by one, pick the ones I like and placed them in my wardrobe, gave one away and listed six on Carousell. Once the bags are sold, the shelves in my wardrobe would be more spacious. Can’t wait to get some cash back and a spacious wardrobe. Next to tidy were my shoes. I have been keeping shoes that I do not wear and after looking at them individually, I realised that a pair has disintegrated which I threw away. I also gave away two pairs and put up two pairs on Carousell for sale. Now my shoe cabinet is more spacious and organised with shoes that I wear regularly. Finally, I took out all my caps that I used to put aside and place them on top of my shoe cabinet that I may wear on my way out. After tidying, my small chest of drawers at my living area that I used to stash my grey zone things is now empty. Following are pictures of my things to be given away after my tidying marathon. Books are the easiest to tidy. I do not have that many as I switched to eBooks and eMagazines a while back. I removed all my books and magazines from my bookshelves and went through one at a time and decided what to keep. Discarded a few magazines into the recycle bin and placed the few books that I do not want into the plastic bag for giving away. I do not have that many papers to start with as my bills and bank statements are already in soft copies. I took out all my documents like tax and income papers, property documents, insurance documents, medical reports, etc and scanned the documents that I need to keep for future references. Destroyed the confidential documents and the non-confidential documents went into the recycle bin. Tidying komono or the miscellaneous items is usually the most challenging. Komono are items like CDs and DVDs, Stationery, Electrical cords, Cables, Memory Cards, Batteries, Medicines, First Aid, Valuables (Cheque Books, etc), Sewing Kit, Tools, Hobby, Collectibles, Linen and Bedding, Towels, Stuffed Toys, Kitchenware (Crockery, Cutlery, Utensils, Appliances, Food Storage, Disposables, Plastic Bags, etc), Bathroom (face and body cleansing items, etc). Tidying the miscellaneous items was not as challenging as I thought. I do not have that many miscellaneous items to start with. I am using most of them, except for the stuffed toys which I gave away a bag of them. As for the kitchenware, I only left with the minimum after giving most of my unused pots and pans to my brother at my last decluttering exercise in May. I took the same approach, removed all the kitchenware from my kitchen cabinet. I organised the kitchenware and store them by category. After tidying, I have an empty drawer and two small empty shelves and my kitchen top looks neater. Yeah! My sentimental items are mainly photos and handmade cards and bookmarks. For the bookmarks, instead of keeping them, I am now using them. For the photos and handmade cards, I tidied them and put them in one box rather than keeping them in different storage boxes. Within two days, I completed my tidying marathon. Now my home is more organised and neat. I am using what I have rather than storing them in the cabinet and most importantly, I feel happy and restful whenever I am home. Discard everything and pick what to keep – keeping things that I truly want or in the words of Marie Kondo, keeping things that spark joy. Enjoyed what you read? Support me by following my blog or subscribing using your email or follow me on my Facebook page @livingforexperiences and Instagram @livingforexperiences and share the post that you like. Every like, comment and share count! Interesting read. I am moving house the end of this month and this is a good time to declutter. I went through the same exercise two years ago, but things just seem to accumulate with time. That’s what happened to me before this tidying marathon. Well, will see if I start accumulating again. Hopefully not. 🙂 Enjoy your decluttering exercise and move. Indeed you are selecting what to keep. For us, we minimize aquiring things as a start, so that too helps to reduce the need to declutter. Good on you. I used to be a shopaholic so I accumulated lots of stuff and only slow down in the last few years because of my multiple home moving.